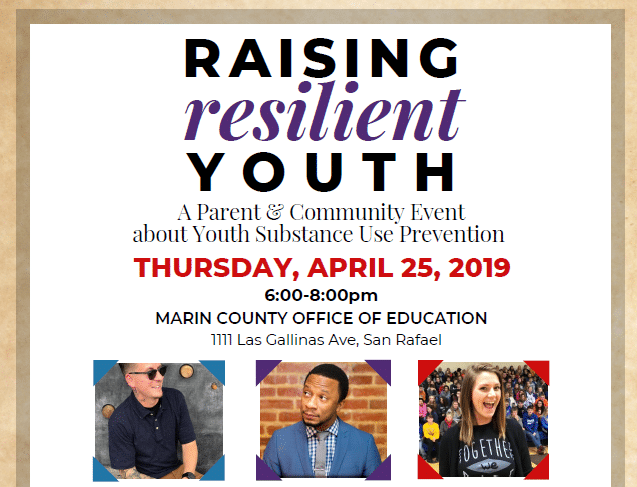 Marin County Health & Human Services Department and the Marin Prevention Network (MPN) are partnering with the Marin County Office of Education (MCOE) to bring to Marin County, nationally-recognized substance use prevention speakers and slam poets to talk to parents and the community on the evening of Thursday, April 25th from 6 to 8pm. 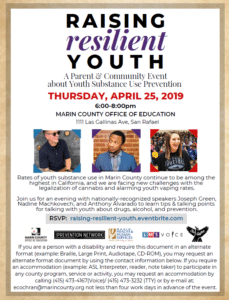 The event, Raising Resilient Youth, is free and will be held at the MCOE Building at 1111 Las Gallinas in San Rafael. For more information on this event please see the attached flyer. To register for this free event please visit: https://raising-resilient-youth.eventbrite.com . The event with have simultaneous Spanish translation services available as well. Joseph is a motivational speaker, workshop facilitator, professional storyteller and award-winning poet, and a person in long-term recovery. With a background in theatre and performance poetry, Joseph seamlessly intertwines storytelling and spoken word poetry to inspire his audience to join him on a journey which uplifts the core principles of self-care, self-awareness, self-forgiveness, and paying your blessings forward to make a world a better place for everyone. He believes in the innate ability of story to connect people to their higher purpose and one another. In 2017 Joseph started LMSvoice, an organization dedicated to helping people and socially conscious organizations discover and share the transformative power of story. We are hoping that you will be able to attend and we would greatly appreciate you helping to circulate the event flyer widely among your networks!